The race to bring the first robot car is well under way. 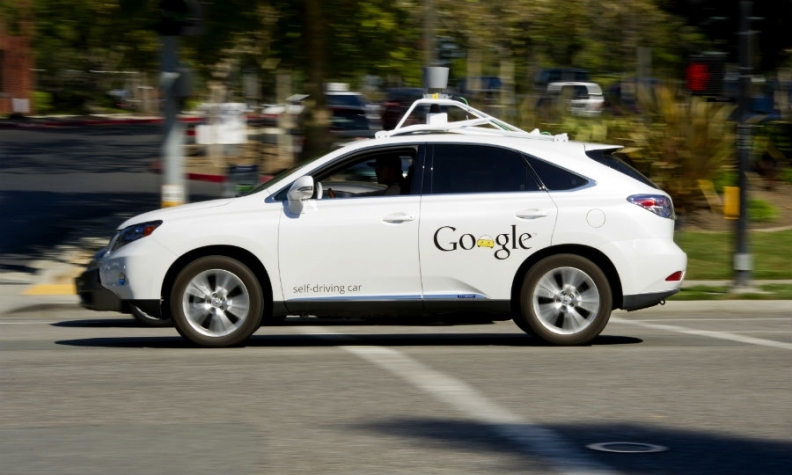 Google showed off a prototype self-driving car in December. NEW YORK (Bloomberg) -- Driverless cars better be able to refuel themselves. They’ll consume more energy than cars with drivers. That’s the somewhat counterintuitive conclusion in a new study by researchers at the University of Michigan in Ann Arbor. They say that autonomous autos could reverse a years-long trend of declining fuel consumption. At least a half-dozen car and technology companies, from General Motors to Google Inc., are developing the futuristic vehicles, which would be guided by sensors and satellite positioning. Here’s how they’d use more energy than conventional cars: more trips. What isn’t known yet is how many people who don’t currently drive, like kids and users of public transportation, will start sharing a self-driving car. Those new trips -- and all the return trips in between -- could mean more total driving. Increased sharing could mean Americans would own 43 percent fewer cars (from 2.1 to 1.2 vehicles per household) but use them 75 percent more (from 11,661 to 20,406 annual miles per vehicle), according to calculations by Brandon Schoettle and Michael Sivak of the U-M Transportation Research Institute. Their funding comes from federal and state government agencies and auto manufacturers and suppliers. There’s a caveat. Automated cars might prove to be better at conserving fuel because they wouldn’t waste fuel flooring the accelerator and slamming on the brakes, like humans do, Schoettle said. They’d be better at avoiding traffic jams and red lights, and would find parking spots without driving around and around and around. Also, ride-hailing apps like those offered by Uber Technologies Inc. and Lyft Inc. could make sharing more efficient. “Shared autonomous vehicles” could use 12 percent less fuel and release 5.6 percent less climate- warming gas than average cars, according to a 2014 study by researchers at the University of Texas at Austin. The race to bring the first robot car is well under way. Google showed off a prototype self-driving car in December. Mercedes-Benz and Volkswagen AG’s Audi unit are testing them, too. Others, such as Toyota Motor Corp., Honda Motor Co. and General Motors, are developing technologies to assist, if not replace, human drivers. Tesla Motors Inc.’s Model S has an “autopilot” mode. Apple Inc. revealed last month that it’s also working on an electric car, although it’s unclear what automated features it might have. What’s also unclear are the regulatory hurdles the invention might have to overcome. Five states have passed laws allowing them, with certain conditions, and six more are considering them, according to researchers at Stanford Law School. Alternative fuels, such as electricity or hydrogen, will probably be part of future driverless cars, said Schoettle, the Michigan researcher. Even so, the additional energy has to come from somewhere, and coal and natural gas supply most of the country’s power.